I guess every small business needs SEO or SEM, but it is a very popular debate which one is more effective in terms of getting returns on your investment and which one is to start first for your new business. Search engine optimization and search engine marketing are two different names but i can say both are aimed for the same purpose or target. Every website or online business wants to grow their business and branding so these are the two techniques that all website must needed to grow their online business. 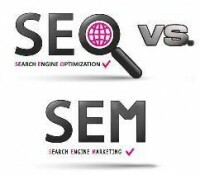 SEO or SEM which one is to start first? Let's think you have start a new business, now you are confused like do i start online marketing with SEO or i start investing with SEM. First let me tell you the basic difference between SEO and SEM, Generally SEO is the technique to bring your site in organic or original search engine ranking results. Whereas, SEM is marketing technique that includes tactics like sponsored or paid ads for advertising a website over search engines, social networking websites, and on your niche websites. have a problem with spending a lot of money, then SEM is the right way to start marketing of your new business. SEO is a long-term approach in the world of internet marketing. Among the most important components of SEO are good quality original content, page optimization and robust link building campaigns. Secondary to the goal of helping a website get a high ranking is building a site that visitors will want to come back to again and again via search engines original results. Whereas, SEM is a very fast and effective process that has the advantage of helping a site to get qualified traffic almost instantly within your budget. There is one disadvantage of SEM: Results don't last when campaigns end. SEO being an on-going technique of website promotion is likely to attract higher Return on Investment. But SEO do not assure immediate results. It may take around 3-6 months to make your website appear on search engines. Whereas SEM is effective and fast but it is presence for only some weeks or some days so it is hard to say to get higher ROI n the starting with your PPC campaigns and SEM strategies. Many Webmasters suggest starting SEO first but this is still very hard to say which is to start first, although i would like to prefer to invest on SEM first but with low budget. But for this your website must have a completed design, no errors or bugs, no dead links, no dead images or no under construction content. SO if you are starting some SEM campaign to advertise your website then you should keep in mind that your website is completed and do not have any dead links or content. Good post,You have some food for thought always, to the extent that the different ways to add some nice changes in your Blog. That was good. I like it and I guess, that I would like to have here some more sources like that. Can you recommend something to me? It sounds like a lot of work. I guess, I'll need a qualified team for it, yes?